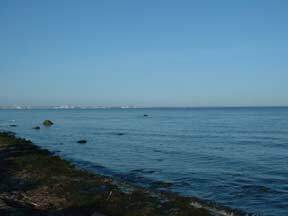 As I write this next installment, I'm on a rock at the beach on the east coast of Denmark, about 40 miles north up the coast from Copenhagen. It's a few kilometers south of a ferry port town called Helsigner (pron. 'Elsinore'). The picture you see is my view. I think it was the afternoon of May 31st. After 3 days, I'd had it with the city of Copenhagen. It sure has some great architecture, though. Time, money and workers were clearly not considered as limiting factors for whoever financed these incredible structures that stand so proudly 4 or 5 centuries later. 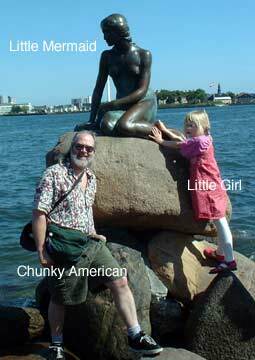 There are many interesting aspects about Denmark. Stores are strictly legislated on when they can stay open. Virtually everything closes by 3pm on Saturdays; most by 1. Food servers have less restricted hours, as do liquor establishments. There seems to be mixed thoughts on whether or not an Internet cafe can be open on a Saturday night, however. Even though they also serve food and may serve alcohol, since that isn't their primary reason for existence it appears their ability to stay open isn't a known quantity to any of the several people I've asked. To complete your visual of the scene around me, my second Carlsborg beer is waiting unopened on my left and I have recently finished dinner, which was composed of some interesting foodstuffs from a newly purchased ice chest. I can tell already the container will be a good addition to the melange already in the car. At the local Qvickly store (think Fred Meyer), I got not only the chest, but some tasty looking food to put in it. To add new items to my 'life menu list,' I also picked up some questionable, more 'theoretically-food' packets, as well. I figure I won't be back this way for awhile so ought to keep trying whatever locals are calling food as I go. I had my first eel the other day, and a herring dish. Now I know I won't starve if I forget my lunch on a salmon fishing trip. At Qvickly, I asked for recommendations from one of the male shoppers who looked representative, in that he was Swedish, of the population of the store. The ferry to the Swedish coast leaves from Helsigner, and it's only a 4km crossing to the Swedish sister city of Helsingborg. Just for that small run, the ferries are about like those that go to Victoria; you can tell they get some winter weather in these parts. From the way the Swedes were packing their carts, food and beer are obviously much less expensive here in Denmark than they are in Sweden. Once I got across to my new Swedish friend what I was after, i.e., food packets I could put in an ice chest for lunch stops and eating along the way, he was quick to recommend a number of items. Unfortunately, a number of these either looked more like what we would think of as a by-product or smelled distinctly spoiled, but wasn't. One of the tastier looking items looked like our pre-cooked formed chicken patties. I find the one I ate to be very much like those except they're made, as are so many things this far north, of fish. Only as a result of his suggestion -- and the fact he watched intently until I put it into my basket -- I got a small vat of lunch spread he raved about. It's apparently made with liver (his English, while better than my Swedish by whatever multiple you'd like to insert, still wasn't very good), which I don't consider to be included in any of the top 4 million food groups. Anyway, I didn't try the spread yet, however did open the 'extra strong' cheese. Now, after those, along with a first Carlsborg and some great long bread that came from a bakery on the way up -- and with the cooler back in the car about 200' from here -- I can still smell the cheese. Extra strong, indeed. My guess is it's made from goat cheese. You know, the stuff that sticks in between goats' toes. Triple extra strong for my homogenized American taste buds, that's for sure. Still, a small slice in a large piece of bread brings a new taste to savor. It's so easy to feel personally ignorant in a country where perhaps the majority know English in addition to whatever else their personal array of tongues might include. Even more speak Swedish, I know. They appear to have many hard drinkers, and are solid supporters of the tobacco lobby. Admirably, they have a social philosophy of taking care of everyone. If you lose your job, you continue to collect the majority of your previous wages for, in some cases, 5 years. After that, all get at least @$1000US per month, I understand. It can still pose a problem if you don't have a house, but there aren't many who've fallen through the net in that regard. Another sign of the Danes 'thinking outside the box,' I was told, concerns how they deal with many of the mentally dysfunctional people in the population. These are thought to be better off out in the community where they can sort of bounce off the public, but continue to live out of an institution or jail. Yesterday morning I had breakfast at an outdoor cafe on the canal in Copenhagen. All the tables were full when an alkie stopped by and went from table-to-table with his rap/harangue. People took it in, though somewhat impatiently. Easy to see who the tourists were, because their attitude was more "get this freak outta my breakfast." It was only when the guy took his shirt off that the waiter trotted down the street and returned shortly with, count 'em, 3 polita officers. They just flanked the offender and walked away from the restaurant with him sort of retreating before them. Once they got about 50' away the officers just walked away in one direction and the guy in another. On Wednesday, my first day in town, the people in power who handle pavement cleaning squired me about from the time I got there until 6pm. 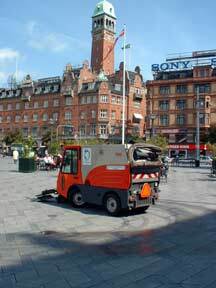 This included having 3 different of their sweepers arrayed in the town's main square for a photo opportunity. Then, they took me on an all-day tour of the city and, I suspect, especially showed me all the places they figured were clean. Mostly, it was. However, I looked at a map and then over the next two days went to some of the places they hadn't taken me. These latter were somewhat more disarrayed, I must say, but all-in-all the managers are doing a great job under completely difficult circumstances. It's difficult to imagine the problems they face, what with several love boats in harbor every day along with who knows how many tour buses. In addition to all the history and amazing architecture, Copenhagen offers an area somewhat unique to the rest of the world, called Christiania. This is a community in Copenhagen begun when a group of people took over an area of the city 30+ years ago and declared themselves a sovereign nation. In part it was to build a separate community, however they also were people who felt strongly that marijuana and derivatives should be legal. I'm sure another big part of the reason for founding the community was so they could smoke and sell herb and hashish, which they've done ever since. The place is also known as somewhere that a number of those mentally challenged types are able to sort of hang out and be okay. The community is completely down on hard drugs of any kind, so its thought that being in Christiania keeps the people out of the hard drug population. I spent a couple of nights at Christiania, which also has the best live music venues in the city, and at the end of the night you'd look around and see that many of the people left at a couple of the bars (the non-music ones) were the derelicts on alcohol overload. Some were having those great, animated conversations we've all seen, but since I'm a polyglot American I have no idea what they were saying. Christiania is located on beautiful land, and there are some quite interesting hippie-type structures that have been put up through the years. Many are 'improvements' on the standard-issue, long/low military buildings that were already there. Lots of people have added many dormers of all sizes and descriptions all over their rooflines. And, I'm told, it's of late been trendy for architects to make outrageous structures somewhere on the land in order to get featured in their trade journals. That juxtaposition of old/funky and new/expensive is beginning to bear the fruits of discord. There's a noticeable fraying around the edges, along with increasing pressure caused by the latest government. It clearly doesn't help that Republicans are now in control of the world -- read U.S., and Bush's trickle-down policy has an effect in even this far flung locale. There's a several acre lake in the middle, and I'm told the 15 square km of the entire Christiania land area is now worth $2 billion US. "Let's see," asked the conservatives in power, each to the others, "would it be better to find a way to shut down a community that 94% of Danes want to continue and ride out a brief, messy storm of popular dissent, or let it continue as one of Europe's largest hashish outlets run by people who pay no taxes? Hmmm, let me see..."
So goes the current debate. And, word is that it's the Hell's Angels and organized crime that have moved in to expand the hashish trade of late. At the same time, these heavy hitters have used their money to grab control of the community's Park Place-type facilities and are monopolizing the internal attempts toward moderation and internal healing, as well. Only if they are able to ride out the current administration, a year and a half to go, then the Christiania community may be able to sort it out. Plus, speaking as ace traveling investigative reporter for streets around the world, the place is trashed. With no signs directing people what to do with litter, and few garbage containers, crap is on the ground everywhere, including the path around the lake. Easy to see why the place is an easy target at the moment. It seemed odd to see relatively large blocks of hash, perhaps 1/2 pound sized, sitting in rows with a 'brand name' and price listed. I didn't see that even in the '60s. Most vendors had small scales and would cut the buyers' grams off with garden shears while standing in booths about like a good structure at Barter Faire. Quite interesting. 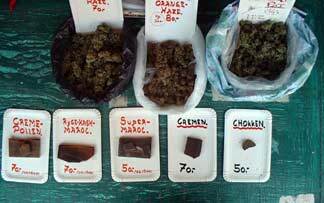 No photos can be taken on 'Pusher Street,' where THC derivatives are sold. One vendor did allow the photo I took of his booth; they all turned their backs while I snapped the shot. It wasn't easy even to take pics of the many graffiti murals and odd structures; usually someone or other was frowning in my direction. (I read in Rick Steves' book that taking photos was "frowned on but tolerated in Christiania," and that's exactly what occurred. As I said, Christiania is clearly the best place to hear music in the whole city. Last night, Friday, there were 7 bands covering 3 venues until after 4am. It's considered in Europe a hip place to play, so the musicians were uniformly hot. There was a jazz grouping from the Copenhagen conservatory players, and a foursome from Russia with a klesmer feel were absolute show stoppers. They had incredibly complex arrangements that may even have been original material. Unfortunately, Danes are cigarette smokers with no thoughts of quitting, so their method of smoking their hashish is to roll chunks up in a hand-rolled cigarette. This created huge levels of tobacco smoke in the clubs, which is not my favorite thing. Although the city officials took me to most of the city's tourist enclaves, I did travel around to some others on my own. This is the famous Little Mermaid, however once here it was easy to somewhat underwhelmed. Still, an obligatory picture seemed in order. Surprising to me, web log-on capability at hotels and at cafes is much more limited than I found in Asia two years ago. Yesterday, I got on briefly in Sweden. I took the train over a several miles long bridge that now goes between Copenhagen and Malmo, Sweden. (You didn't know?!) I finally found a cafe open in Malmo, but the 6 of us using the computers must have all been on a 56k modem, tops. Getting my email was completely laborious, especially since most everybody in there were showing their geographical solidarity with the Danes across the water by smoking cigarettes, though without the hashish addition. In the Malmo town square I saw two Arabian-looking couples, and one of the women was taking the picture of the 3 others. So, I offered to take the picture so they could all be in it. Once that was over, I asked where they were from. "Iraq," one of the men answered. "Where are from you?" A couple seconds of silence ensued on my part. "I'm an American," I answered. Quick glances were exchanged among the couples, and another few seconds passed by. "I think we need a picture together," I said, breaking the silence. "Then I can show it to everybody I know and they'll see we're all just good people doing the best we can." An immediate grin lit up all their faces. The woman with the camera grabbed it back out of her bag with obvious enthusiasm. With the three of us guys hugging tightly together, she carefully took a picture with both cameras. "We'll show everyone, too," said one of the men, pumping my hand firmly up and down. "Thank you for showing us." We parted as friends. The other photo animated with them was one of the statues in the square we were in. It seems appropriate to have music included in the scene, since in my experience that's one of the best ways there is to get people together in peace. Whew! I just opened my 2nd Carlsborg and discovered why I am still smelling the cheese; the odor is coming from my fingers. Kind of a cross between old gym locker and dog poop doormat in the sun, but there's also another delicate addition I just can't place at the moment. You get the idea. Located here in Helsigner is Kronberg Castle, which I toured today. Shakespeare named his locale 'Elsinore,' which is how Helsinger is pronounced, so the locals have made the castle somewhat of a shrine to Shakespeare. For many years they have hosted world class performances with renowned actors periodically throughout the year. Someone told me in bad English the castle is one of the wonders of the world, but I can't confirm that. As you can see, the castle has a tower at each end, between which are about 100 yards of assorted rooms. Moat in front and sides, and a wall to the beach on the 4th side. Lots of tapestries to scope out. The dungeon was as dreary as one might expect, only with somewhat larger cells than usual. That's because the only people held for long periods tended to be political prisoners who one might have to give back expeditiously due to changing times. However, under those luxury suites were THE CATACOMBS. Getting thrown into that place must have been misery incarnate. The ceiling dripped water even through mortar they've put on as a preservation assist. All was damp, and cold as cadavers, but less cheerful. The tunnel wound down, down, with occasional small openings in the sides where cells once were. 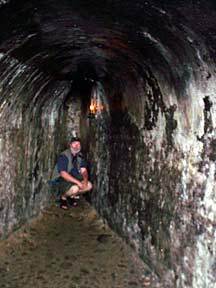 There were a couple of larger areas that had the look-and-feel of torture chambers, but who knows. Since I was there at the tail end of the day, the guide was right behind me blowing out all the lamps. It was actually sort of spooky. Can't imagine people existed there for long. At the very end the tunnel (it's all tunneled out of rock) the space narrowed down to perhaps 5' high and a slot had been chiseled into the very end. Apparently, a board went into the slot such that it could be adjusted to whatever ceiling height they wanted their special prisoner to enjoy. For bad offenses, probably for things like eating a venizon snack from the King's forest, the miscreant was retained in a squatting position. Also shown in the animated gif is a nearby fountain and the harbor, also within 1/2 mile, where I bedded down for the night in the wagon. As I said in the previous installment, since the seats recline fully the Mercedes is actually a fairly comfortable sleeping arrangement. And, since I'm of Scottish descent, I enjoyed saving the US$100+ a room in Copenhagen runs. Speaking of tastes, I now know why common vernacular includes the pleasure of 'having a Danish' in the morning. I've always thought it was because of the wonderfully flaky pastry one can get even in any 7-11 type of store in the country, but it may not be. The women in Copenhagen were, on average, the most beautiful I've ever seen anywhere. Most all of the population bicycles to work and to otherwise get around town, and that no doubt contributes to their litheness. Plus, women here wear virtually no makeup, something I've always appreciated. For whatever reason(s), it was amazing to see one blonde beauty after another go by on their bike throughout my days spent there. An initial driver's license in Denmark costs about $1600US, which is done to keep car travel minimized. One result is to see many old people, in all types of dress, on their bikes with baskets to hold their goods. Sometimes, you see people bicycling along with both hands full of stuff they've bought, kind of like someone driving while they talk on a cell phone and shave. There are bike lanes throughout Copenhagen (and in all Danish cities, I'm told), with their own set of traffic lights, even. Bikes are parked everywhere in huge arrays along the roadways and in front of major buildings. Copenhagen has a free in-town bicycle program where you put in 10 or 20 Kroner and get a bike from a rack. Then, if you plug its chain gizmo back in at one of the many free bike locales, you get back the coin. Although a great way for tourists and others to get around town, many of the bikes needed some work. One day, the only working bike I could find had no front wheel attached. Fortunately, the wheel and all needed parts were located near by. I put it together with my fingers, however could find no place with a spanner so had to stop every 5-6 blocks and re-tighten the nuts by hand. Someone made off with it where I parked it while taking the canal boat tour. They may have been visited by somewhat instant karma in the form of losing the front wheel. As I travel more, I realize there is one thing that America completely lacks, and that is history. We don't have it in any of our infrastructure or in our culture, itself. If we had more time under our belts, I think we might be better equipped to be in our current position as world leaders. As it is, the juxtaposition makes it appear to many that we are like a young child fumbling with a loaded gun in a small, crowded room. Well, I'm down to only a few minutes of battery power left, the tide is coming in and the sun is below some trees, so this has to be about it. I'm so glad I brought a 12v to 110 converter that works in the cigarette lighter of the car. That's been the best way to recharge. Wish I'd brought a small extension cord so I could have several items plugged in at once. The camera goes through AA batteries quickly, and I've also been charging the dv movie camera that way. Not enough driving when I'm in town to keep them all charged up. Well, that's it for now. Oh, I forgot to mention that I've been trying all the ice cream I can find. This is one of my favorites, a blackberry outer coating with vanilla inside. MMMmmmmm.